Just a quick update, we released a new version of Bean’s Quest on Android to resolve some performance issues. Unfortunately when we made some changes to improve performance on older devices on Android, our changes (ironically) resulted in some performance problems for specific new devices like the Galaxy Nexus. Of course we couldn’t let performance degrade on the flagship developer device, so we have resolved the problem now! We’ve also become aware of a bug in the World 5 Level Select screen, stopping iOS users from collecting all the diamonds on the screen and achieving the Game Center achievement for it. Oops! We’ve gotten quite a few requests for a definitive list of the Golden Jump Pars in Bean’s Quest. Here is a breakdown, per world, of every Golden Jump Par in the game! Be warned, these pars are not for the faint of heart! Based in Melbourne? 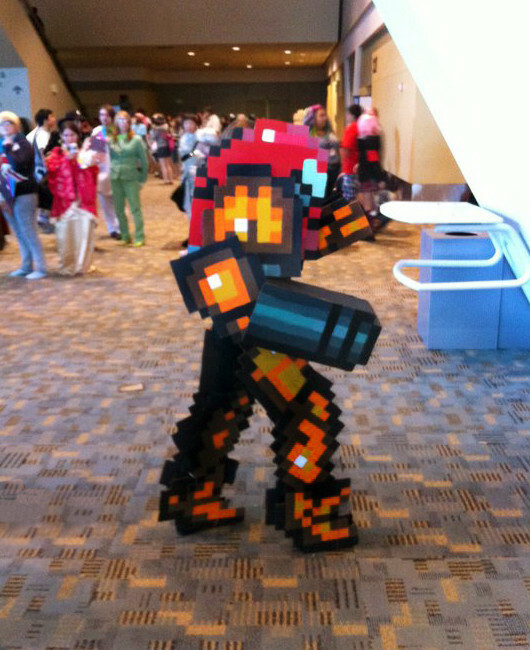 Interested in video game cosplay? The Academy of Interactive Entertainment (AIE) are organising a Guinness World Record video game cosplay event for this Saturday 5th May, at Fed Square in Melbourne. Come as your favourite video game character or put together an impromptu costume (Minecraft Creeper = painted cardboard box?). In fact, we’re helping sponsor along with other Melbourne indie studios and game companies! Don’t forget to register as well for the event to get some swag otherwise your cosplay won’t count towards the record – a few indies in Melbourne and other companies are helping out! For full details on this Melbourne event check out here. Image sourced from Global Geek News article. Boston Indie Showcase + More! Firstly, we’re very pleased to announce today that Bean’s Quest will be on display at the Boston Indie Showcase as part of this year’s PAX East event. This will be our first visit to any PAX event and as you can imagine we’re super excited. Penny Arcade have announced the news on their website which you can read here. The official page for the BIS is available here as well. We’re pretty proud to be showing the game alongside other games such as Girls Like Robots, Lawnmower Challenge, Not Without You, SpellTower and Super Crate Box! Secondly, we’ve just been featured on the Mac App Store! We can’t wait to see the new reach this will give us in exposing the game to new audiences. Awesome! Lastly, lots of people have told us how they want to play Bean’s Quest but they don’t have an iPhone or a Mac. So we’re currently working on getting bringing Bean’s Quest ready for Windows and Linux. We’ll be releasing the game via Desura, aiming for a 27th Feb release. Again, this will let even more people play Bean’s Quest!